1) They're easy. Sprinkle a packet of seeds on the soil in early spring. (I sowed in mid-March, but I think you might even be able to sow in February.) Scuff the dirt around a little. Make sure they get some moisture and watch as countless little sprouts emerge. The garden dirt, as you can see from the file below, was not the best. Basically, it's clay with a bit of mushroom compost mixed in. The mustard greens thrived in it. Mustard greens sprout and grow incredibly easily. With two small packets of seeds I ended up with countless plants jammed together in three-and-a-half rows. 2) They're beautiful. My mother, who has been gardening for a long time, actually thought the mustard greens were some sort of ornamental ajuga. Seriously, you could grow mustard greens just for their looks (if it weren't for the fact that the plants look pretty ragged later on once the insects discover them). I grew Purple Osaka and Red Giant varieties.Couldn't decide which one was prettier, but they're both rather purplish. 3) They're tasty! The kind of mustard that you put on a hot dog, as I understand it, comes from the ground seeds of the mustard green plant. I think both the flowers and seed pods are edible, but I didn't get a chance to try either one before my plants expired or I had to pull them. Anyway, as you could guess, the greens are fairly spicy as well. They start out milder as baby greens with just a nice little zip and get quite hot as they get older. 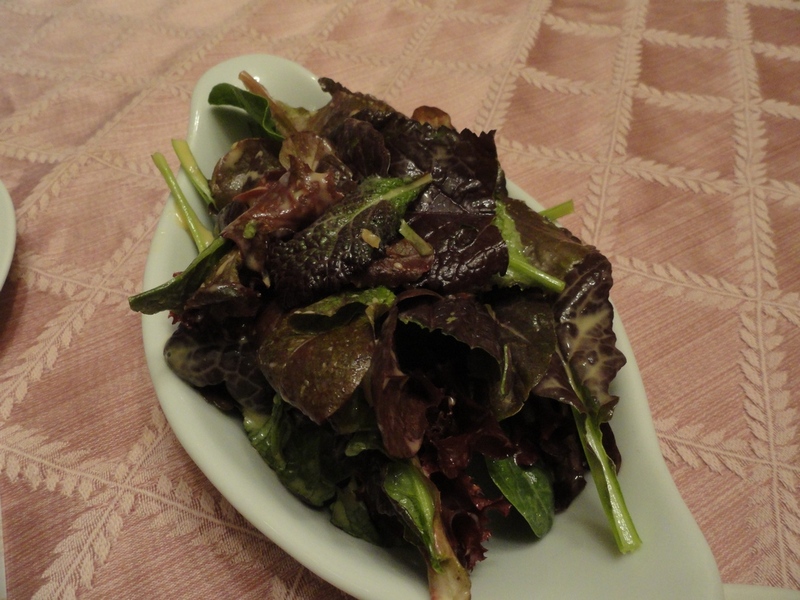 You can definitely eat the baby mustard leaves raw in salads, but it's generally recommended to saute the larger leaves and even then, they'll get kind of bitter. 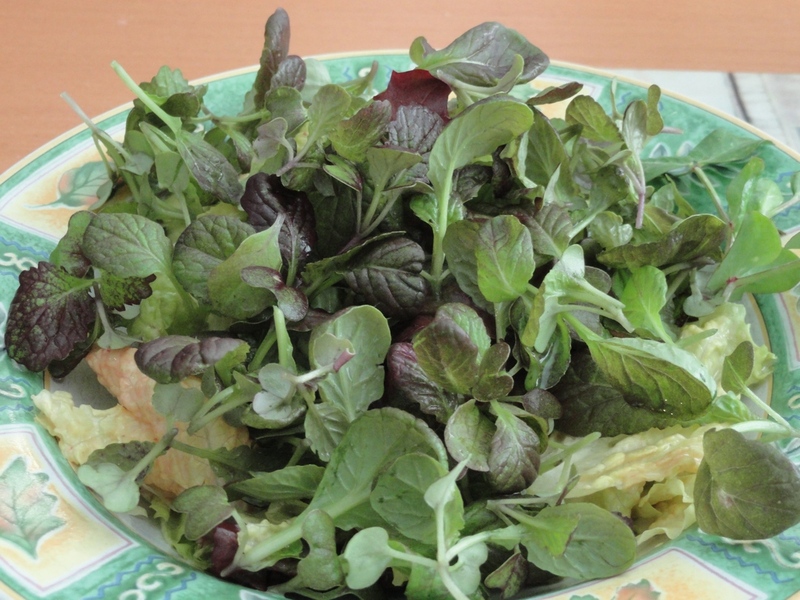 Another salad, this time with a heavy proportion of mustard greens in their prime. 4) They're nutritious! 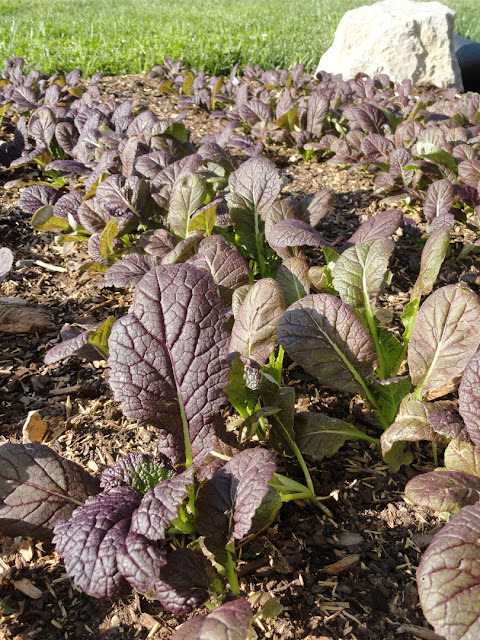 According to Tufts University's New Entry Sustainable Farming Project, Mustard Greens contain high levels of calcium, iron, folate, vitamin C and vitamin K.
So far, they sound like the Magical Perfect Green. So what are the drawbacks that have me questioning if I will grow them again anytime soon? 1) Insects love them too. 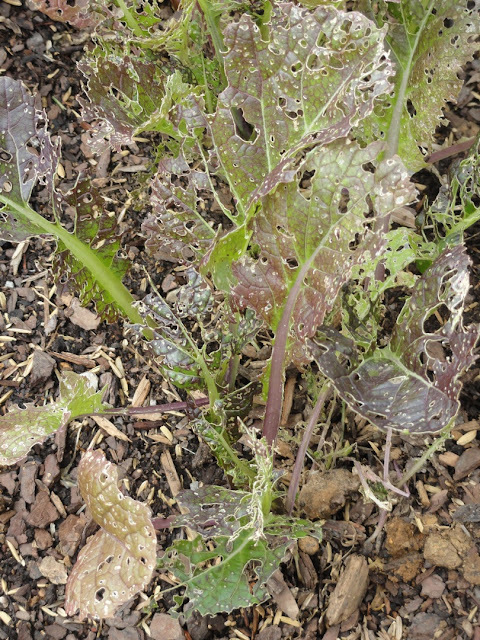 As with the collard greens, if you're trying to practice organic gardening, you're going to end up with a LOT of insect damage. At least, I did. I suspect that slugs, cabbage loopers and cabbage worms were the main culprits. Not sure what the organic solution might be. I didn't want to mess around with row covers, but I probably should have tried beer traps to cut down on the slug population. Apparently, there are also parasitic wasps that prey on some of these caterpillars. I'm not sure of the best way to attract those wasps, but perhaps sowing sweet alyssum near the mustard greens might help? Or maybe it's a better idea to plant mustard greens in the fall so that they mature in cooler weather when there are fewer insects around? These mustard greens have been skeletonized. In some cases, the leaves are pretty much all gone and only the ribs remain. This scene of devastation was repeated throughout the mustard green bed. As with the collards, turning over the greens with somewhat intact leaves often revealed eggs and/or caterpillars. 2) They're spicy! Tastes vary. I thought they got a bit too spicy and bitter as they matured. My wife still liked the flavor. This was one of the few mustard green plants that got really big despite suffering a good deal of insect damage. I kept waiting to see if it would flower, but I needed the space for summer crops, so I ended up pulling it. 3) Thinning isn't much fun. Mustard green seeds are tiny. Which means it would be incredibly tedious to plant them one at a time. Which means I ended up sifting them out of my hands into the rows. Which means that they sprouted incredibly thickly and I had to go through and spend hours pricking out seedlings. On the bright side, those seedlings make a tasty addition to a salad. But it's an awful lot of work trying to pull out seedlings without injuring the neighboring plants and kind of sad to pull seedlings that are just starting to do their thing. 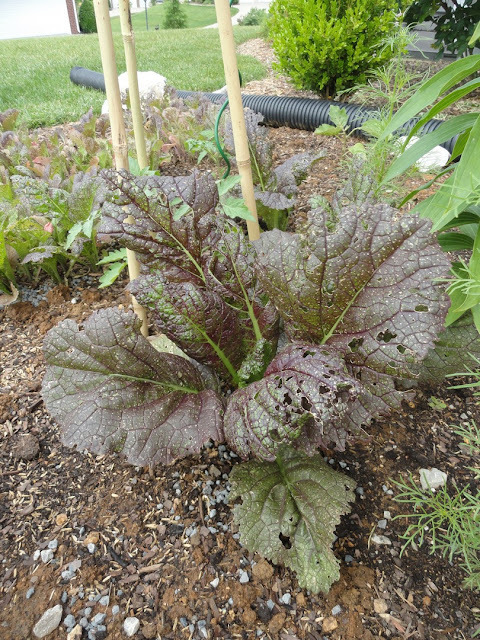 Will I grow mustard greens again? Probably not anytime soon. I think I'd prefer to keep looking for some more pest-resistant crops of leafy greens (spinach and lettuce both had much less insect damage this year). And besides, I have a relatively small garden bed and experts recommend not planting brassicas in the same spot more than once every three years to cut down on the likelihood of soil borne diseases. I cannot wholeheartedly recommend growing mustard greens for most organic gardeners, but if you happen to have a greenhouse or you don't mind wrestling with row covers, then mustard greens could be a wonderful crop. And even if you don't grow them, I'd strongly suggest seeking them out at your local Farmers Market to have a spicy nibble.